Cubane (C8H8) is a synthetic hydrocarbon molecule that consists of eight carbon atoms arranged at the corners of a cube, with one hydrogen atom attached to each carbon atom. A solid crystalline substance, cubane is one of the Platonic hydrocarbons and a member of the prismanes. It was first synthesized in 1964 by Philip Eaton and Thomas Cole. Before this work, researchers believed that cubic carbon-based molecules would be too unstable to exist. The cubic shape requires the carbon atoms to adopt an unusually sharp 90° bonding angle, which would be highly strained as compared to the 109.45° angle of a tetrahedral carbon. Once formed, cubane is quite kinetically stable, due to a lack of readily available decomposition paths. It is the simplest hydrocarbon with octahedral symmetry. Having high energy but kinetic stability makes cubane and its derivative compounds useful for controlled energy storage. For example, octanitrocubane and heptanitrocubane have been studied as high-performance explosives. These compounds also typically have a very high density for hydrocarbon molecules. The resulting high energy density means a large amount of energy can be stored in a comparably small amount of space, an important consideration for applications in fuel storage and energy transport. Allylic bromination with N-bromosuccinimide in carbon tetrachloride followed by addition of molecular bromine to the alkene gives a 2,3,4-tribromocyclopentanone. Treating this compound with diethylamine in diethyl ether causes elimination of two equivalents of hydrogen bromide to give the diene product. 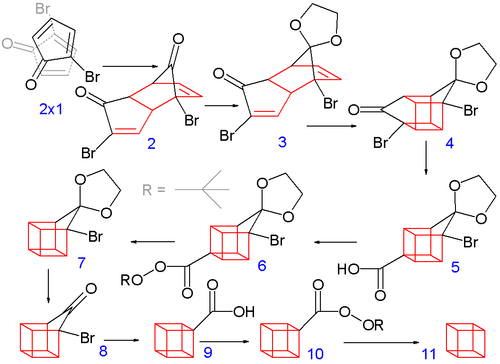 The construction of the eight-carbon cubane framework begins when 2-bromocyclopentadienone undergoes a spontaneous Diels-Alder dimerization, analogous to the dimerization of cyclopentadiene to dicyclopentadiene—two molecules of 1 react to form 2. For the subsequent steps to succeed, only the endo isomer is useful, and this is the predominant isomer formed in this reaction. This is the most likely product as a result of minimized steric interactions between the bromine of each molecule with the bromine and carbonyl of the other when the reactants approach each other and minimized like-dipole interactions in the transition state of the reaction itself. Both carbonyl groups are protected as acetals with ethylene glycol and p-toluenesulfonic acid in benzene; one acetal is then selectively deprotected with aqueous hydrochloric acid to 3. In the next step, the endo isomer 3 (with both alkene groups in close proximity) forms the cage-like isomer 4 in a photochemical [2+2] cycloaddition. The bromoketone group is converted to ring-contracted carboxylic acid 5 in a Favorskii rearrangement with potassium hydroxide. Next, the thermal decarboxylation takes place through the acid chloride (with thionyl chloride) and the tert-butyl perester 6 (with tert-butyl hydroperoxide and pyridine) to 7; afterward, the acetal is once more removed in 8. A second Favorskii rearrangement gives 9, and finally another decarboxylation gives, via 10, cubane (11). The synthesis of the octaphenyl derivative from tetraphenylcyclobutadiene nickel bromide by Freedman in 1962 pre-dates that of the parent compound. It is a sparingly soluble colourless compound that melts at 425–427 °C. A hypercubane, with a hypercube-like structure, was predicted to exist in a 2014 publication. Two different isomers of cubene have been synthesized, and a third analyzed computationally. The alkene in ortho-cubene is exceptionally reactive due to its pyramidalized geometry. At the time of its synthesis, this was the most pyramidalized alkene to have been successfully made. The meta-cubene isomer is even less stable, and the para-cubene isomer probably only exists as a diradical rather than an actual diagonal bond. ^ Nomenclature of Organic Chemistry : IUPAC Recommendations and Preferred Names 2013 (Blue Book). Cambridge: The Royal Society of Chemistry. 2014. p. 169. doi:10.1039/9781849733069-FP001. ISBN 978-0-85404-182-4. The retained names adamantane and cubane are used in general nomenclature and as preferred IUPAC names. ^ a b c Biegasiewicz, Kyle; Griffiths, Justin; Savage, G. Paul; Tsanakstidis, John; Priefer, Ronny (2015). "Cubane: 50 years later". Chemical Reviews. 115: 6719–6745. doi:10.1021/cr500523x. PMID 26102302. ^ a b Eaton, Philip E.; Cole, Thomas W. (1964). "Cubane". J. Am. Chem. Soc. 86 (15): 3157–3158. doi:10.1021/ja01069a041. ^ Eaton, Philip E.; Cole, Thomas W. (1964). "The Cubane System". J. Am. Chem. Soc. 86 (5): 962–964. doi:10.1021/ja01059a072. ^ Freedman, H. H. (1961). "Tetraphenylcyclobutadiene Derivatives. II.1 Chemical Evidence for the Triplet State". J. Am. Chem. Soc. 83 (9): 2195–2196. doi:10.1021/ja01470a037. ^ Freedman, H. H.; Petersen, D. R. (1962). "Tetraphenylcyclobutadiene Derivatives. IV.1 "Octaphenylcubane"; A Dimer of Tetraphenylcyclobutadiene". J. Am. Chem. Soc. 84 (14): 2837–2838. doi:10.1021/ja00873a046. ^ Pawley, G. S.; Lipscomb, W. N.; Freedman, H. H. (1964). "Structure of the Dimer of tetraphenylcyclobutadiene". J. Am. Chem. Soc. 86 (21): 4725–4726. doi:10.1021/ja01075a042. ^ Pichierri, F. (2014). "Hypercubane: DFT-based prediction of an Oh-symmetric double-shell hydrocarbon". Chem. Phys. Lett. 612: 198–202. doi:10.1016/j.cplett.2014.08.032. ^ Eaton, Philip E.; Maggini, Michele (1988). "Cubene (1,2-dehydrocubane)". J. Am. Chem. Soc. 110 (21): 7230–7232. doi:10.1021/ja00229a057. ^ Minyaev, Ruslan M.; Minkin, Vladimir I.; Gribanova, Tatyana N. (2009). "2.3 A Theoretical Approach to the Study and Design of Prismane Systems". In Dodziuk, Helena (ed.). Strained Hydrocarbons. Wiley. p. 55. ISBN 9783527627141. ^ Smith, Michael B.; March, Jerry (2001). March’s Advanced Organic Chemistry (5th ed.). John Wiley & Sons. p. 1459. ISBN 0-471-58589-0. ^ Kindler, K.; Lührs, K. (1966). "Studien über den Mechanismus chemischer Reaktionen, XXIII. Hydrierungen von Nitrilen unter Verwendung von Terpenen als Wasserstoffdonatoren". Chem. Ber. 99: 227–232. doi:10.1002/cber.19660990135.